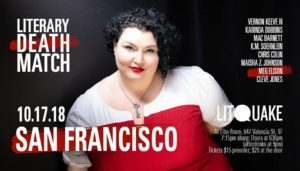 In our annual return to the wonder of Litquake, Literary Death Match returns to Elbo Room for a wily, vibrant night of readings, wit-fueled commentary, and a game-show finish. It’s going to be magic. Click here to see the full lineup and guarantee you’ll see it by preordering now! Note: This show is 21+.